HARMAN, the premium global audio, visual, infotainment and enterprise automation group (NYSE:HAR) , and Pono Music shared with attendees at the Consumer Electronics Show in Las Vegas their vision for offering the highest quality music to the automobile market. 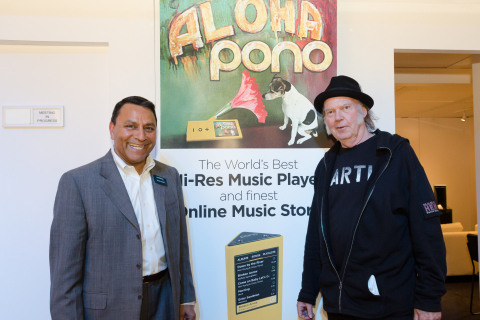 Legendary recording artist Neil Young and HARMAN Chairman and CEO Dinesh Paliwal discussed solutions to offer the PonoMusic catalog and supreme, lossless HD quality playback in vehicles. On display at CES is HARMAN’s new Harman Kardon(R) Omni HD-enabled multi-room wireless speaker system, launched in Europe this fall and set to ship in the U.S. in January 2015. Last year at CES, HARMAN revealed a software-based solution called Clari-FiTM to enhance digitally compressed music. This HARMAN technology today can be found in a variety of automobiles, consumer electronics and mobile devices, including the LexusTM NX, Hyundai ASLAN, JBL(R) Authentics and the HTC One(R) (M8) Harman Kardon edition smartphone. Also announced at CES, Clari-Fi has been ported to the Cirrus Logic Smart Codec platform. HARMAN (www.harman.com) designs, manufactures and markets premier audio, visual, infotainment and enterprise automation solutions for the automotive, consumer and professional markets. With leading brands including AKG(R), Harman Kardon(R), Infinity(R), JBL(R), Lexicon(R), Mark Levinson (R) and Revel(R), the Company is admired by audiophiles, musicians and the entertainment venues where they perform. More than 25 million automobiles on the road today are equipped with HARMAN audio and infotainment systems. HARMAN has a workforce of approximately 16,600 people across the Americas, Europe, and Asia and reported sales of $5.6 billion for the 12 months ended September 30, 2014. The Company’s shares are traded on the New York Stock Exchange under the symbol NYSE:HAR. PonoMusic (www.ponomusic.com) was founded in 2012 by Neil Young, the legendary musician who has been on a quest to revive the magic that has been squeezed out of digital music due to the popularity of compressed formats. Today you no longer have to choose between quality and convenience when listening to music – you can have both with PonoMusic. PonoMusic is the world’s first end-to-end high-resolution music ecosystem, including the highly anticipated hi-res online music store officially launching at CES, the highly acclaimed and magical PonoPlayer, and the PonoMusic World desktop software used to purchase, download, and manage your music. The PonoPlayer is available for preorders now on PonoMusic.com, and is on sale at a number of high-end audio and record stores throughout the United States (http://retail.ponomusic.com). PonoMusic is also proud to announce that the PonoPlayer will soon be on sale at Fry’s Electronics and other high-end retail chains.